U.S. Secretary of State John Kerry, front left, and Italy's Foreign Minister Paolo Gentiloni, front right, take part in an international conference on Libya at the Ministry of Foreign Affairs in Rome, Dec. 13, 2015. U.S. Secretary of State John Kerry is joining foreign ministers from European and Arab nations Monday in Paris for the latest talks on the battle against Islamic State and efforts to foster a political resolution to the situation in Syria. Diplomats are trying to build momentum for a meeting Friday in New York that would include U.N. Secretary-General Ban Ki-moon and his envoy for Syria Staffan de Mistura. They want a foundation for a cease-fire and political process based on international agreement last month in Vienna to launch peace talks by January 1. The push toward negotiations is the most serious in nearly two years since two rounds of U.N.-brokered peace talks ended in early 2014 with little progress. Since then, what began as a number of opposition and militant groups fighting largely against the government of President Bashar al-Assad has grown more complex with the rise of the Islamic State group and it's seizure of large areas in eastern Syria and northern and western Iraq. 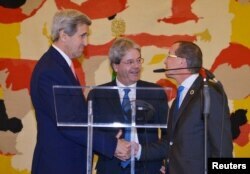 Italy's Foreign Minister Paolo Gentiloni (C), U.S. Secretary of State John Kerry (L) and UN special envoy for Libya Martin Kobler at a joint news conference following an international conference on Libya at the Ministry of Foreign Affairs in Rome, Dec. 13, 2015. The result has been a multi-faceted conflict with various groups fighting each other for territory, as well as the introduction last year of a U.S.-led coalition conducting airstrikes against Islamic State and in September Russian forces launching their own air campaign. The fighting that began in March 2011 has left more than 240,000 people dead and forced more than 11 million people from their homes, including a large influx who have sought safety in Europe and forced governments there to scramble to respond. Kerry will travel Tuesday to Russia for meetings with Russian President Vladimir Putin and Sergei Lavrov for further talks on progressing the political track in Syria as well as fighting Islamic State.